The Kind of Sort of Sequel to Knocked Up, but it's really more of a spin off. The real life Apatow clan at the premiere of This is 40. Judd Apatow is probably my favorite comedic film maker, and what he was able to to with Paul Rudd and Leslie Mann's (who is in fact Director Judd Apatow's real life wife) characters Pete and Deb in Knocked Up was to balance out all the madness that the Seth Rogen gang (Rogen himself, Jonah Hill, Jason Segel, Jay Baruchel, and Martin Starr) brought to the table. That worked out perfectly for that film because you had a couple to show the more adult life required of parenthood as Rudd and Mann raised daughters Sadie (Maude Apatow, Judd's real life daughter) and Charlotte (Iris Apatow, Judd's youngest real life daughter). While Pete and Deb's family was one of the best parts of Knocked Up, the problem they run into with their own film is there is nothing to balance them out.  While the film tried with new characters by adding the likes of Megan Fox, Chris O' Dowd, Jon Lithgow, and even Melissa Mcarthy, nothing could recapture the comedic magic of the Rogen trope. It was nice, however, to see Jason Segel and Charlyne Yi return to their respective roles of Jason and Jodi from Knocked Up! You have almost non stop Rudd Vs. Mann throughout the entirety of the film, which after a 2 hour and 17 minute run time makes the audience feel a bit exhausted. What keeps the audience invested throughout this film is how invested Apatow managed to make us in this couple in Knocked Up, so naturally you care enough to see where the next phase of their marriage is going to take them. .....but these guys are the irreplaceable originals! Apatow finds some success in This is 40 because he puts these fictional characters through so many real life problems (that most American families can relate to) all while keeping them somewhat lovable and subtlety funny throughout the film. If you know anything about this fictional family from Knocked Up you may be thinking, "What kind of real life turmoil can this plush California couple go through? The last time I saw them they had it pretty good." Well naturally things have changed a lot since 2007: Pete took the risk of starting his own record label which isn't boding well in the current economic climate, the couples teenage daughter Sadie is is going through exactly that, being a teenager, and both Pete and Deb are having parental issues of their own. By the end of the film you'll feel like you have been through all this with their family and you can relate. but sadly Rogen didn't feel the need to return to the role that made him truly famous! 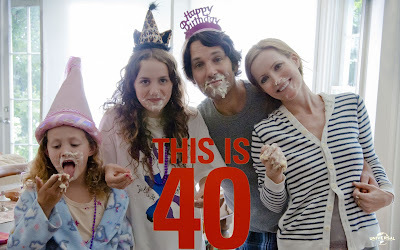 Overall, is "This is 40" the laugh out loud comedy that Knocked Up was? No. 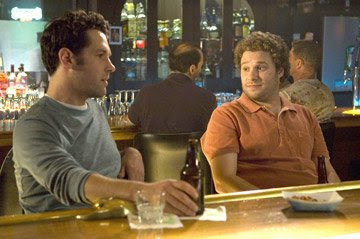 You won't get to see Paul Rudd and Seth Rogen trip out on psychedelics or make Back to the Future jokes. However what you do get is a weighty but well written Apatow comedy that makes you think about life and family. It could have used a few more one liners as well as a cameo by Seth Rogen as the one and only Ben Stone with his now 5 year old daughter (even if Katheine Heigl didn't show, up who cares?). 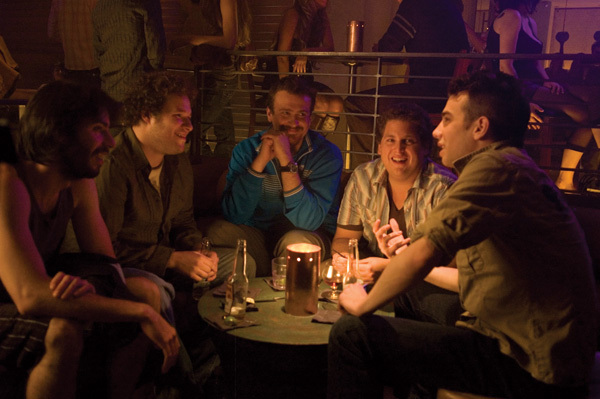 After all, it was the Apatow role that made Rogen the A-list comedic star he is today.